Capt. Noel Von Urff graduated from Villanova University. After graduation, he joined the U.S. Air Force and became a command pilot and flight instructor on C-124s and C-141s. He served in Vietnam and was awarded the Air Force Commendation Medal, the Air Force Expeditionary Medal with five oak leaf clusters, and the Vietnam Service Medal with five oak leaf clusters. As an Air Force reservist, he flew the C-5A. His airline career started with Seaboard and finished at FedEx. After he retired from FedEx, Noel was appointed as a magistrate for the state of Delaware by Governor Russell Peterson. He was also elected to serve two terms as a member of the Board of Education of Holy Cross Schools in Dover. Capt. Noel Von Urff was predeceased by his son Kurt. He is survived by his wife of 38 years, Kathleen; son Herbert and his wife, Sheri; his mother, Mary; his brother, Gregory; sisters Roberta Sweeney and Barbara Lyons; and granddaughter, Emily Ann Von Urff. 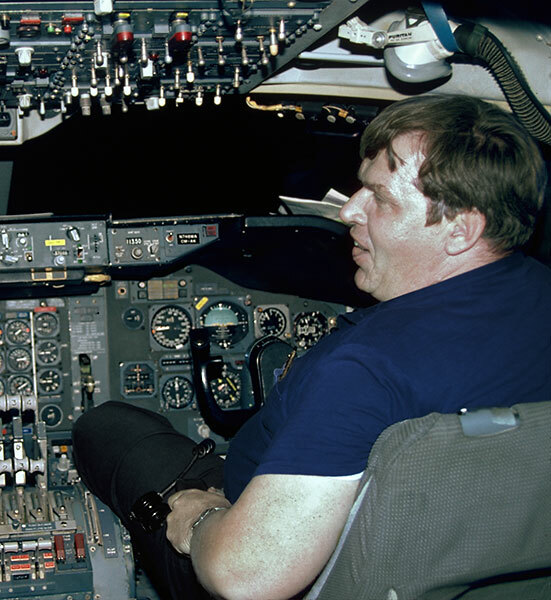 He is seen here in a Boeing 747.